Colorful, cheery, bright, fun! 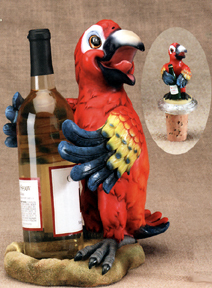 Family, friends, a bottle of wine and a whimsical parrot wine holder will bring fun to any occasion! This very happy parrot comes with a cork bottle topper which is another matching parrot holding a bottle! Just too cute for words. The brightly colored parrot waiting to put his/her wings wrapped around a bottle for safe keeping! Even if you aren't a wine drinker, use it as a bottle holder for flavored vinegars or decorative oils! Fabulous gift idea! The coordinating coasters have arrived! Just too cool! 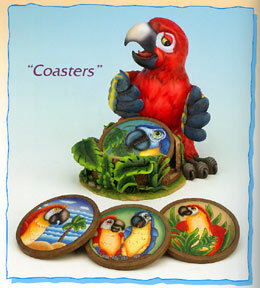 Each set comes with a whimsical, fun coaster holder which includes 4 coordinating coasters! These can't help but put a smile on your face ... great gift, great collectible and a great way to keep those nasty rings off the coffee table!